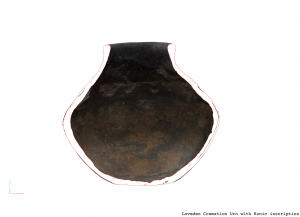 To secure interactive access to a unique Anglo-Saxon cremation urn in the British Museum collections a digital 3D model has been compiled using digital photogrammetry. This very detailed model can be rotated and studied from any angle and from anywhere in the world using an internet browser. The pot, excavated at the Loveden Hill cemetery in Lincolnshire during the early 1960s, is a 5th- or 6th-century Anglo-Saxon cremation urn, the only example found to date bearing a Runic inscription and one of the earliest examples of written Old English (or its Germanic precursor)- (Catalogue Number- British Museum 1963,1001.75; height 155mm, diameter 180mm). 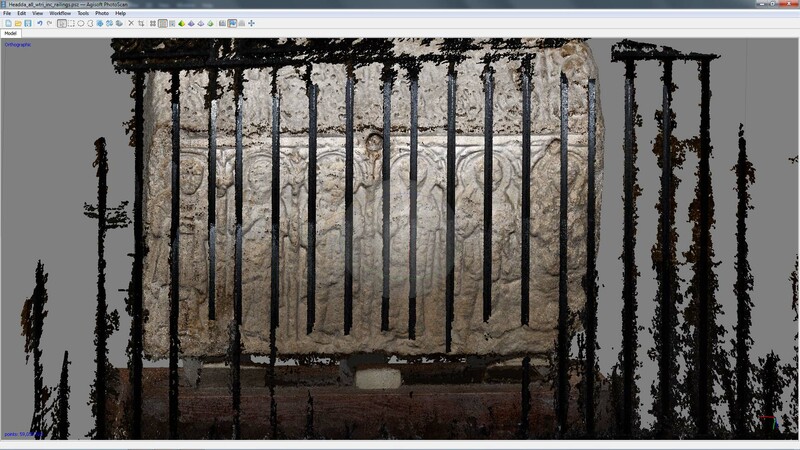 The the 3D model enables more accurate analysis of the inscription in its object context than would be possible from conventional drawings and photographs or by looking into a museum display case. This model has been created as part of a collaborative project between The Landscape Research Centre, the Department of Britain, Europe and Prehistory of the British Museum, and The Impact of Diasporas on the Making of Britain research programme (University of Leicester, University of Nottingham, and the Leverhulme Trust). Although the most common burial rite in Early Anglo-Saxon England was inhumation with individuals burials fully clothed individuals complete with objects often referred to as ‘grave goods’, these frequently included jewellery and other objects such as weapons, some individuals were cremated and the ashes buried in pots termed ‘cremation urns’. Small numbers of cremations occur in very many of the excavated inhumation cemeteries such as at West Heslerton, where of 16 cremations considered to Anglo-Saxon in date 11 were associated with pottery vessels. A small number of very large cremation cemeteries are known, such as at Spong Hill in Norfolk where more than 2200 cremations have been excavated, or at Sancton in East Yorkshire where several hundred cremations have been examined through a number of different excavations, and at Loveden Hill in Lincolnshire where the estimate of the number of cremations exceeds 1000. One of the most significant feature of these cremation cemeteries is the dominance of heavily decorated pots. About 75% of all the excavated cremation vessels were decorated, in contrast with the situation on domestic sites where decorated vessels are an exception. At West Heslerton, for instance, where the total excavation of an Early to Middle Saxon settlement covering more than fifteen hectares, recovered only a few more than 6000 sherds of Anglo-Saxon pottery, fewer than 300 fragments were decorated. 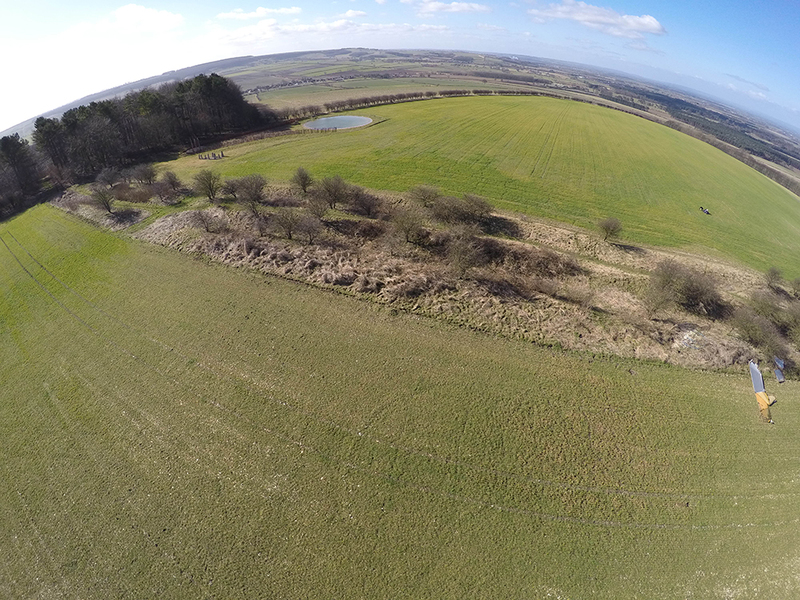 The first Anglo-Saxon burials recorded from Loveden Hill were discovered in excavations undertaken in 1925/6 when a burial mound or barrow on the hill was examined. In 1955, deeper than usual ploughing brought large quantities of Anglo-Saxon pottery and cremated bone to the surface over an area covering more than 4,500 square yards (3,700sq.m.) near the excavated barrow. Excavations carried out over several years showed that the scale of the cemetery was very large; excavation of considerably less than half of the estimated area of the cemetery revealed just under 500 cremations and a dozen inhumations. Amongst the many heavily decorated cremation vessels one had been decorated with stamped decoration and a runic inscription contained by spiralling grooves around the shoulder of the pot. The runes on this urn make it a useful piece of evidence for linguists as well as for archaeologists. The earliest surviving evidence for runes dates from the later 2nd century AD; the oldest inscriptions are on metal objects recovered from bog deposits, presumed to have a ritual function, in northern Germany and Denmark. A 1st-century fibula found at Meldorf (Schleswig-Holstein, Germany) may represent the oldest known example of runic writing, but specialists remain uncertain about whether the inscription is in runes or Roman letters. The older inscriptions use a 24-letter alphabet (usually referred to as the Older Futhark; the name Futhark comes from the sounds of the first six characters), which is attested in some 300-400 inscriptions and remained in use up to c.700 AD. From the 8th century onwards, it was replaced in Scandinavia by a 16-letter rune-row (with variation between “long-branch” and more radically simplified “short-twig” letter forms). By the end of the 11th century, the Viking-Period futharks were being expanded by the use of diacritic dots, and these expanded futharks were eventually replaced by runic alphabets with designated equivalents to all the letters of the Roman alphabet. Some of these more elaborate runic alphabets remained in use into the Early Modern period (and possibly later) in certain regions. In England, the evidence from the early Anglo-Saxon period is very scant: perhaps 15-20 objects with runic inscriptions dating from before c.650 AD are known. All are short (3 words or less), most are difficult to read and/or interpret, and all are on portable objects, some of which may have been made and/or inscribed elsewhere. They represent a valuable, if sparse and problematic, source of evidence for the language of early Anglo-Saxon communities. In England and Frisia, several new characters were added to the runic alphabet at some point during this period. It is not clear whether or not the creator of the Loveden Hill inscription used a form of runic writing which included these extra characters (which is why the rune A is sometimes transliterated a and sometimes æ). Most of the runic writing in Anglo-Saxon England dates from the 8th to 10th centuries and uses an alphabet with further additions and more standardised forms. 2. § ï. There has been much debate among runologists about the origin of this character and which sound or sounds it represented in the earliest stages of runic writing, but here it is assumed to represent a long vowel [i:], possibly with nasalisation [ĩ:] (see Waxenberger 2010:156, 455-466). 4. A æ (transliterated a in some of the literature). 6. Either A æ or l l with two parallel strokes (note that the vertical is doubled). 7. D d. The two vertical strokes following this character are normally assumed to be a word divider. 8. From this point on, the reading becomes much less certain (especially from no. 12 to the end). This character could be either W w, or a somewhat asymmetric form of ê þ. These two characters are easily confusible. On purely formal grounds, w might seem the more likely: if it is þ, the top of the vertical is truncated (compare no. 3), but given the rather erratic execution of the carving, especially towards the end of the sequence, it would be unwise to rule out either reading on this basis. 10. This character is read as K k in some of the literature (see Parsons 1999:56-57). Because of the eccentric angle, Bammesberger (1991:127) suggests that it might be ï u. Against this reading, Parsons notes its small size relative to the rest of the text. Waxenberger supports Bammesberger’s position, again pointing out the odd orientation of the character (2010:157). To add to the confusion, we should also note the existence of a variant form (the so-called Dachform “roof-form”) of k, ^. This form is attested on the Continent among the “South Germanic” inscriptions, and also on another inscribed object found in England (the Watchfield case fitting), which may be of Continental provenance (Scull 1992; Parsons 1999:68-70). 11. Like no. 8, this could be W w or ê þ. See comments above. Following this character are two vertical strokes interpreted throughout the literature as a word divider, like the verticals after no. 7. 12. This character resembles a reversed Roman N, and may be a variant of H h.
14. This character is similar to no. 6 and might be A æ or l l (see above). 15. Most problematic of all, the final character looks somewhat like a Roman K and does not clearly resemble any known rune. Page (1999:180-181) suggested that it might be F f (on the basis of which Odenstedt (1980) read nos. 12-15 as hlaf = OE hlāf “bread”), but this must be regarded as a very speculative reading, which has been rejected by more recent commentators. Another proposed reading is W w (Elliott 1989:52; Eichner 1990:325; Bammesberger 1991:127-128), but this is also very uncertain. 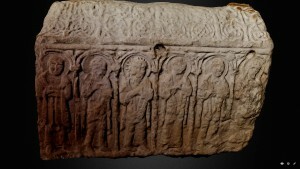 The inscription contains a personal name Sīþæbæd or Sīþæb[æ]ld. The remainder of the text is much more difficult to read and interpret. Following the name is a sequence of characters which has been read as þikþ, þikw þiuw, þiuþ, wikw (see above). Bammesberger suggests interpreting it as þiuw “female servant” (cf. OE þeowu) (Bammesberger 1991:125-128; also Waxenberger 2010:157), but both the reading and the interpretation are criticised by Parsons (1999:57; see Waxenberger, loc. cit., for a response to Parsons’ comments). The final sequence of characters presents even greater difficulties: it has been interpreted as hlāf “bread” and as hlǣw “tomb” (Waxenberger 2010:157, with references), but neither of these proposals is entirely satisfactory. The final character in particular does not clearly resemble any known runic graph-type. Aside from the difficulties of reading the inscription, the very uniqueness of this inscribed urn offers an interesting problem for linguists. Loveden Hill is one of the largest early Anglo-Saxon cemeteries known to archaeologists, second in size only to the cemetery at Spong Hill, Norfolk. Of the many hundreds of cremation urns recovered from these and other sites, this is the only one that has been incised with writing. Three urns at Spong Hill have been stamped with a single word alu (possibly meaning “ale”, “magic” and/or “protection”) in so-called “mirror-runes”; all three were made with the same stamp. Otherwise, runes are not found on any cremation urns either in Britain or on the Continent. It is customary for runologists to assume that the number of surviving runic inscriptions must be only a small proportion of those that were made and that the apparent small size of the corpus results from the paucity of the archaeological record; yet in the case of cremation urns we have abundant data, but only these few examples of the use of writing. Whatever the function of the inscription on this object was, writing on urns was certainly not a normal part of funerary practice in the communities which used the Loveden Hill burial site, nor of their contemporaries elsewhere in the Germanic-speaking world. The 3D model is of enormous benefit to runologists and to historical linguists as it enables us to examine the individual characters easily and carefully at high resolution, and in a format which encourages the scholar to consider the materiality of the object along with the linguistic analysis of the text. The characters become progressively harder to read as we move from left to right, which may suggest that the writer moved his or her hand around the object at a rather awkward angle, rather than rotating it as he or she worked. This would be consistent with the uneven line of the text. Working with the model enables the viewer to see more easily the flow of the lines running around the urn, which appear to have followed the line of the text rather than the contours of the object. 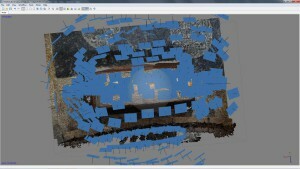 Using the combination of powerful desktop computers, modern digital cameras and 3D image processing software, digital photogrammetry allows us to create precise 3D models of everything from small objects to large chunks of landscape without the costs and time constraints that are associated with the use of laser scanners or the technical skills and specialist equipment required for conventional analogue photogrammetry. At this point it is worth stating that to get high quality models one needs first of all to use high quality lenses, a camera recording images at high resolution on an appropriate sensor, with a minimum amount of digital noise, on a firm tripod. A high powered computer with a lot of memory and a powerful graphics card, ideally a games computer with 32-64 Gb of RAM is not strictly essential but is really necessary if processing times are to be measured in days rather than weeks. For this model more than 600 104Mb photographs were taken and saved in RAW and JPEG formats. RAW files store exactly what the camera sensor records in contrast with JPEG images, which employ averaging to discard data and make much smaller files, which should be perceptibly ‘identical’ although technically they are not. These were taken using an Olympus OM-D EM5-ii camera body, an Olympus 7-14mm PRO lens. The Olympus EM5-2 has a facility for recording 40Gb images by combining 8 16Gb images gathered sequentially whilst shifting the sensor in half pixel units but it is essential that the camera remains absolutely still. 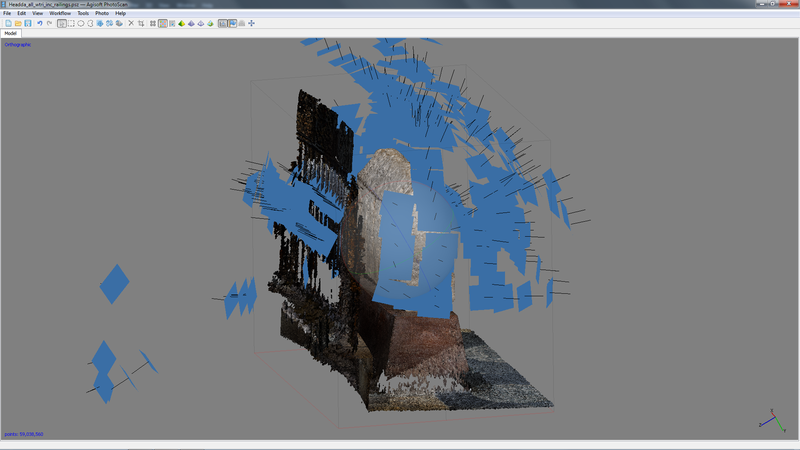 The model Loveden Main was generated using the 40Gb images, but from JPEG files. The recording of a relatively small but broad vessel like this with a narrow neck is particularly challenging, as each point on the vessel, inside and out must be clearly visible in multiple images taken from many positions, this is particularly critical where sharp edges such as the rim of a vessel are to be modelled. Because the vessel was quite deep a particular challenge was to ensure that the depth of field was as large as possible without compromising the image quality; by using a very small aperture all images were recorded with an aperture of F8 which gives the deepest depth of field without any loss of sharpness. The data was processed using two computers a highly specified PC with 48Gb of RAM, a 3.6Ghz I7 processor and Nvidia GTX 670 graphics card with 4Gb graphics RAM and an iMac Retina 5K with 4Ghz I7 processor, 32Gb of RAM, and an AMD Radeon R9 295x with 4Gb graphics RAM. The images were very slightly adjusted using Adobe Lightroom, primarily to adjust the light temperature, and eliminate the blue cast resulting from the use of LED lights. Agisoft Photoscan Pro was used for all modelling work; experience with many different packages led to this choice of software which remains the most appropriate tool for this type of work. The software uses algorithms based around what is termed Structure From Motion or SFM to build the model from multiple photographs. It is an established rule of SFM that the no two images should be taken from the same position and convention is that to record an object such as a pot you need to move round the vessel taking pictures all the way round. For the Loveden Hill runic cremation pot and for many small objects this is not practical without the facility of a dedicated studio, so an alternative approach has been used in which the background is draped with a plain sheet which is easily masked in the photographs and the object is placed on a rotating cake stand and the camera locked tightly on a tripod. To minimise camera shake the images are recorded using a silent digital shutter, a feature of the camera, and the camera is fired using a smart-phone using a wireless connection. To secure sufficient images to create the model the camera was set in seven different positions and a full circuit of overlapping images taken from each position as shown in the two images below. To record the base and lower body the pot was inverted on the rotating platform. In order to be able to create an accurately scaled model, part of the body was recorded twice once including a scale bar which was used to set the scale of the object. In addition to the model displayed using Sketchfab on the Internet, a 3D Adobe PDF file was generated which incorporates the scaled model and can be examined using Adobe Reader which includes 3D measurement functions and a facility to display cross sections oriented in any direction. The singular advantage of creating a 3D model of the type presented here is that anyone, almost anywhere in the world can examine this object closely viewed from any angle at any scale using a web browser, shading can be turned on and off and, whilst the model does not represent a physical copy or ‘preserved version of the object’, it does provide an interactive and visually precise version of the object. Whilst a user could download the files that make up the model and look at them on their own computer, the use of Sketchfab and a web browser makes this unnecessary. Sketchfab – a software utility designed to deliver 3D content on the internet – does exactly that and also effectively provides an archive store. The models will be downloadable from the Sketchfab site once the project is concluded for use in other software. 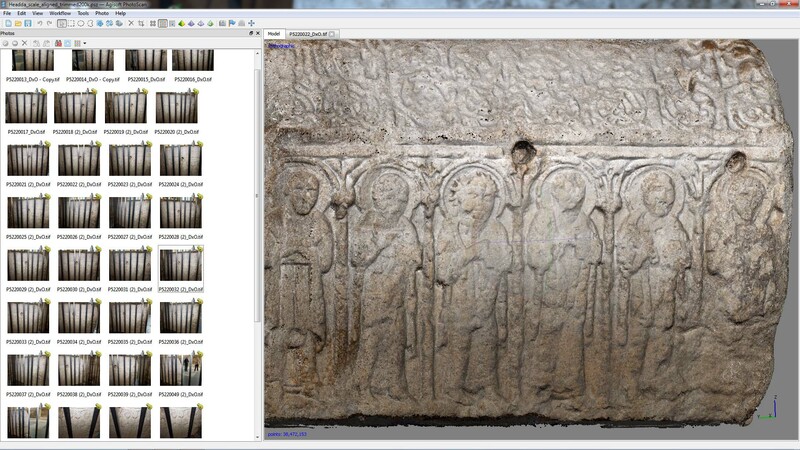 It is arguable that the creation of the models offers researchers now and in the future greatly enhanced access to a unique object in one of the world’s most significant museums but without Sketchfab the full power of the 3D resource would be of limited value. We are indebted to the Trustees of the British Museum not only for letting us undertake this research but also for providing space for us to work in, and to the others using the research room who might have preferred not to put up with the interruption provided by the constant movement, bright LED lights and quiet but continuous instructions between members of the team as the photographs were taken. We are also indebted to Agisoft and to Sketchfab for their support and encouragement. It took most of a day to take the images. Once the photography was complete several days work was required to check the pictures, eliminate any poor quality images and then mask the background in each image. 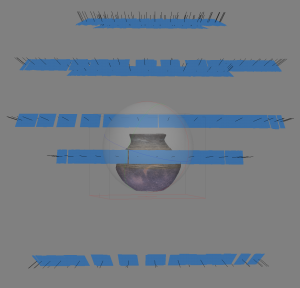 The process of masking areas (which tricks the software into believing it is the camera that was moving rather than the object) Involved masking areas of background and also any areas that were out of focus. 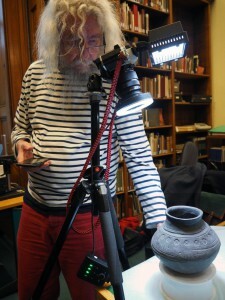 It was for instance impossible to get sufficient depth of field, particularly when trying to photograph the pot from above to include the rim and the base of the interior; the only way to have solved this would have been to photograph the pot from further away but this would have limited the resolution of the final model. Once all the masking was complete both computers spent several days generating models at a variety of different precisions before the models were finalised. Bammesberger, Alfred. 1991. “Three Old English runic inscriptions.” In Old English Runes and their Continental Background, ed. Alfred Bammesberger. Heidelberg: Winter. pp. 125-136. Barnes, Michael P. 2012. Runes: A Handbook. Woodbridge: Boydell. Eichner, Heiner. 1990. “Die Ausprägung der linguistischen Physiognomie des Englischen anno 400 bis anno 600 n. Chr.” In Britain 400-600: Language and History, ed. Alfred Bammesberger and Alfred Wollmann. Heidelberg: Winter. pp. 307-333. Findell, Martin. 2014. Runes. London: British Museum. Odenstedt, Bengt. 1980. “The Loveden Hill runic inscription.” Ortnamnssällskapets i Uppsala årsskrift 1980:24-37. Page, R.I. 1999. An Introduction to English Runes (2nd edition). Woodbridge: Boydell. [1st edition 1973]. Parsons, David. 1999. Recasting the Runes. The reform of the Anglo-Saxon futhorc. Uppsala: Institutionen för nordiska språk. Scull, Christopher. 1992. “Excavation and survey at Watchfield, Oxfordshire, 1983-92.” Archaeological Journal 149:124-281. Waxenberger, Gaby. 2010. Towards a Phonology of Old English Runic Inscriptions and an Analysis of the Graphemes. Habilitation thesis, Ludwig Maximilians-Universität München. Waxenberger, Gaby, and Kerstin Kazzazi. In preparation. Edition of Old English Runic Inscriptions: Vol. 1 (Pre-OE inscriptions); vol. 2 (OE English inscriptions). http://www.anglistik.unimuenchen.de/forschung/forsch_projekte/runes_project/index.html. To download scaled versions of the model for examination using Adobe PDF Reader select either of the links below and download the file. 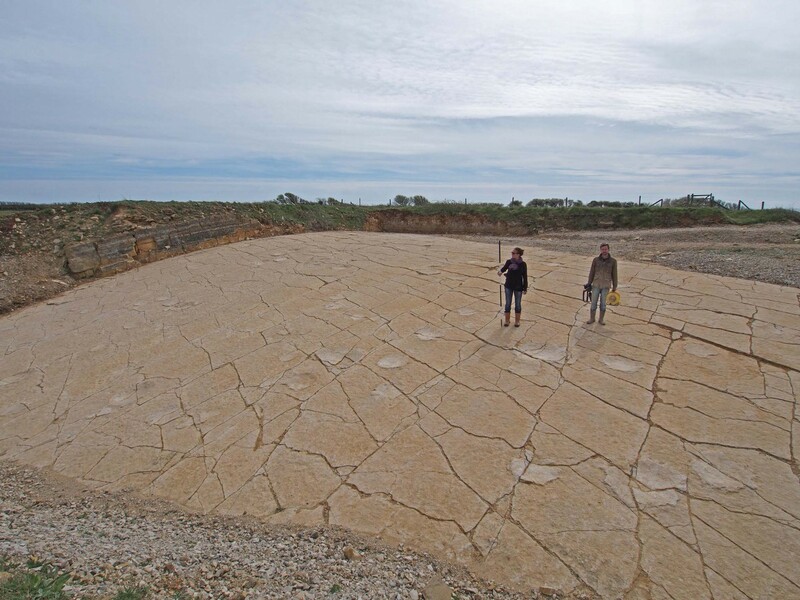 In 1996 during quarrying work in an area then operated by Keates Quarry, Purbeck a remarkable set of dinosaur footprints were discovered which were to turn out to be the one of the most extensive exposures of dinosaur footprints in Britain. This trackway of footprints was discovered around 140 million years after they were originally tramped into the mud. They are the prints of Sauropods, either a brachiosaurid or a tatanosaurid (Wright 1997:185). The prints are comprised of circular craters in what was originally mud, created over a period of time as the sediment dried out on a beach next to a freshwater lagoon. During that time, a number of different individuals, including a juvenile, walked over this patch. The prints were then sealed by the swift deposition of sediment over the top – perhaps the result of a storm – where the mud was transformed into stone which ensured their preservation.Many dinosaur footprints have been found both on the coast of Purbeck and in the quarries, but these sauropod tracks are the only place where a great number can be seen still in the bedrock, where they have lain for millions of years. The footprints are found within the Purbeck Freestone, one of the many different limestones that form the Purbeck beds. The late Jurassic and Cretaceous periods were marked in Purbeck by subtly changing environments. As a result, it is a geological landscape formed of many layers of stone, whose characters vary greatly both between and across them. As well as this variation in geological formation, subsequent processes have tipped, rippled and eroded the stone, making the Purbeck beds a real challenge to understand. As well as the geologists, the quarrymen here have a very detailed and tacit understanding of this geology. The limestones in Purbeck have made it a site for intensive quarrying since the Roman period ( if not before). 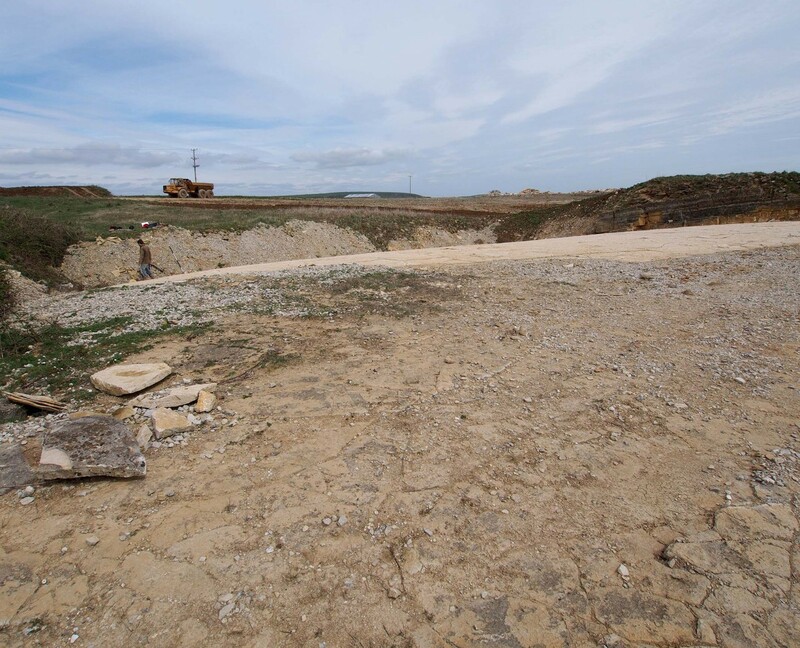 In the process of quarrying, many geological discoveries have been made, from Beckles mammal pit at Durlston in 1857 to the more recent discovery of fossilised trees and turtles at the Haysom’s Quarry. These footprints were first noticed when Kevin Keates was quarrying the Freestone, a limestone valued for its ability to be worked in any direction. The Upper and Lower Freestones are separated by a bedding plane and it is here that the footprints were preserved, on the surface of the Lower Freestone. After the Keates had stripped off the Upper Freestone, the top surface of the Lower Freestone was left exposed. It was then that Trev Haysom, on a winter walk, noticed depressions which he thought were footprints and alerted Kevin Keates to the discovery. The low sunlight defined the prints, and having seen them in other nearby quarries, Trev was able to identify them as dinosaur footprints. Geologists were brought in, and it was decided to preserve the site. Quarrying ceased and the footprints were temporarily re-buried with a protective covering of fine gravel and long term responsibility for the site handed to the National Trust, who own the land. In 2013, the decision was made to uncover the footprints once more whilst the National Trust and the Jurassic Coast World Heritage Site Team worked together to develop a long term management strategy. The whole surface covering an area 34 x 24 metres at its greatest extent was meticulously cleaned by National Trust volunteers but this raised the question of exactly how to document, preserve and display them? It was decided that of high priority was to gain a detailed record of the prints, since it was uncertain how they might weather in the exposed Purbeck landscape. 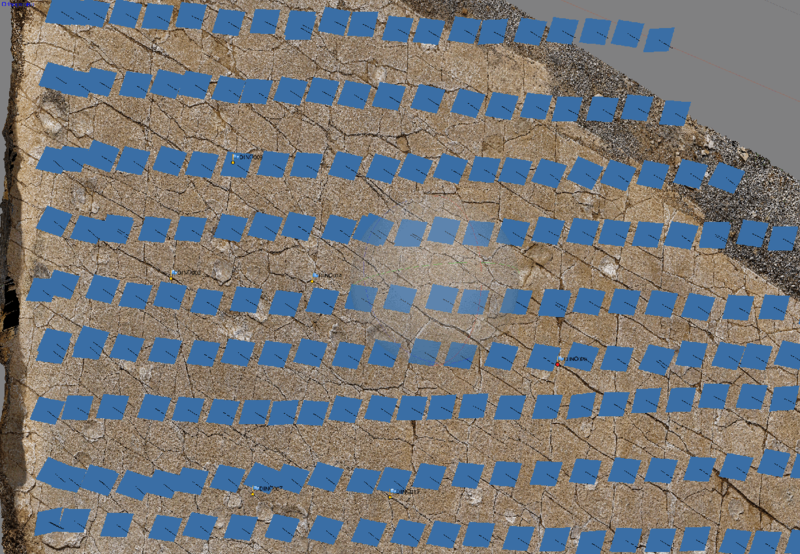 Digital Photogrammetry or 3D imaging (3Di) was chosen as a method which would not only allow a detailed record of the footprints to be created but would also record the topography of the whole of the limestone surface. Recording in this way would ensure that these unique features could be viewed by the wider public and researchers alike, using an internet browser on a computer connected to the internet anywhere in the world. The method also allows for the creation of standalone 3D models which could be stored in 3D format in Adobe PDF files which can be freely downloaded by schools and other interested folks who do not have live access to the internet. To record the footprints an Olympus OM-D EM-1 digital camera was mounted on a 6m high photo pole, the camera being controlled using a remote control device or a mobile phone with live view so that the person controlling the camera could control most of the camera functions and fire the shutter from the ground. More than 1500 photographs were taken in standard jpeg and RAW formats – the jpeg images employ compression techniques to average the values of some pixels to reduce the file size whereas the RAW files record an uncompressed image directly from the sensor in the camera. In order for the software (Agisoft Photoscan Pro) to calculate the camera positions build the 3D model an image overlap of 60% is preferred in all directions. It was difficult to be certain on the northern edge of the degree of photo coverage and overlap and ascend set of photographs was created at a more oblique angle. The primary photographs were taken at an angle of about 10-20 degrees from the vertical. In fact problems arising from the curved nature of the surface being recorded meant that the more oblique images were mostly unsuitable for precise modelling and were not used to produce the final model. It took most of a day to collect the photographs but several weeks of image editing, masking and processing on two very high powered computers ( an Apple IMAC 5K retina and a purpose built windows games machine with 48Gb of RAM and top of the range Intel I7 processor and gaming graphics card ) to create the finished model. The reason for using what would normally be termed a gaming machine is that the software can use the immense power of the gaming graphics card to undertake a lot of the most intensive 3D graphics calculations. 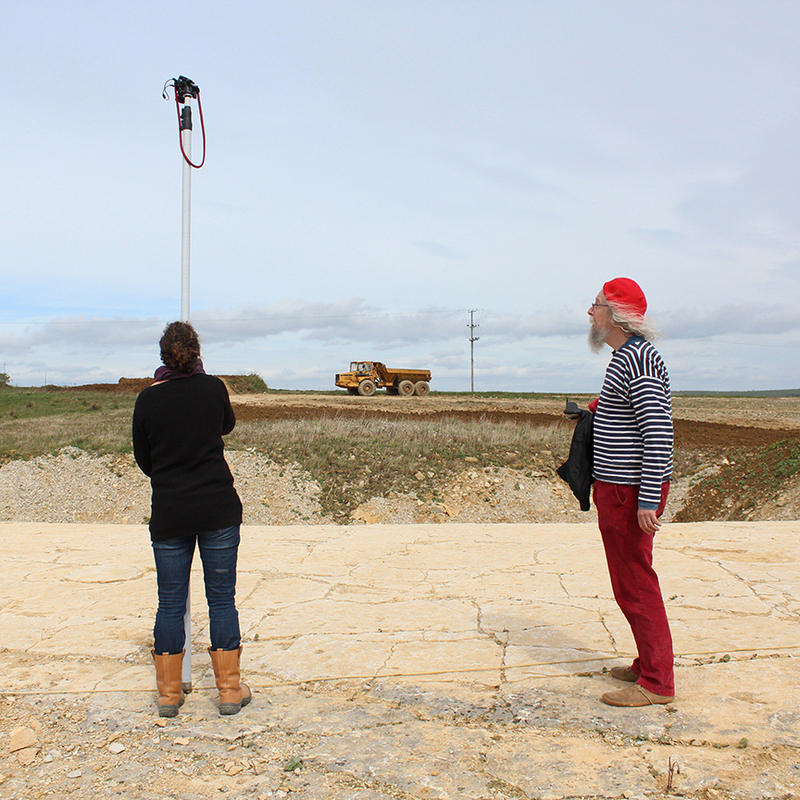 Once the images were examined and the primary model complied Fraser Sturt from the University of Southampton visited the site with Rose Ferraby with a print of the full model, marked up with key survey points each of which was recorded using a high precision GPS. Using these points the model was finally processed and set in true geographic space to form a permanent scaled record that can now be used to monitor change over time as this magnificent story of past stampings from 140 million years ago is available for the public to visit and walk amongst the prints. The results of this project can now be viewed by all using an internet browser (currently this is best done using Firefox, although internet browser capabilities change all the time) on a computer and even on a smart phone. 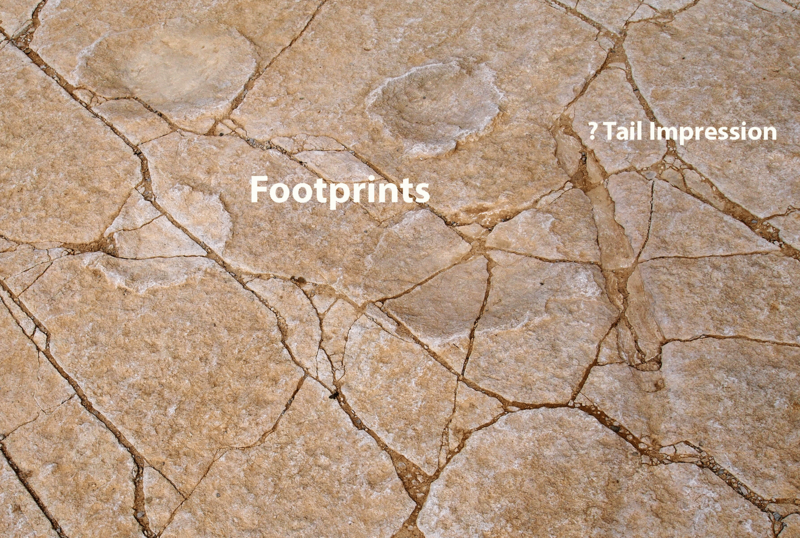 In addition to showing the entire pavement a second model (see above) was complied to show what is believed to be a single footprint 90cm across with small c.10cm footprints of a possible infant dinosaur running cross one edge. In another area a fossil grove has been interpreted as the impression made by a tail hitting or dragged through the mud or alternatively a piece of vegetation pressed into the mud and thus leaving the fossil impression. The footprints are now recorded in their present condition for posterity. It is hoped that the same process can be repeated again to see how they are weathering in a few years time. The footprints will be open for the public to view later on this year starting in May or June. The opening of the footprints and arrangements for pubic access will be announced on the Jurassic Coast World Heritage Site website with detailed information regarding how to get to the site. Visitors should be aware that although the discoveries were made when the site was under the management of Keates Quarry, following the discovery the site was been handed back to the National Trust who have been restoring the land around it to secure the site for safe public access. Keates Quarry is an operating stone quarry, located some distance from the footprints and access to the footprints cannot be gained through the quarry. Once the Site is opened to the public the 3D models and other resources resulting from this exciting and challenging recording project will all be available on the Jurassic Coast Website. The Headda Stone is a remarkable and unique example of a Middle-Saxon sculpted stone, perhaps the focus for a shrine, in the form of a ‘house’ with carvings of Christ, the Virgin and 10 other figures (presumably 10 of the 12 apostles), set within an arched colonnade, with 6 figures on each of the long sides of the stone. The whole block measures a little more than 1m x 0.75m x 0.35m and has been weathered and worn to varying degrees. The ends appear to have been reworked not only removing carved detail but at one end adding a date of 870, considered by Prof. Rosemary Cramp and others to be considerably later than the true date of the sculpture. The ‘roof’ is decorated with four ornamental panels on each slope. 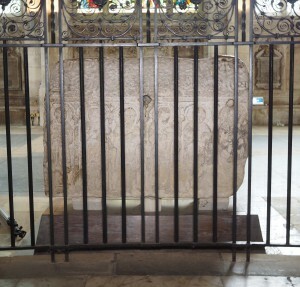 The Headda stone currently sits in the Lady Chapel behind the High Altar in Peterborough Cathedral but is thought likely to have come from the former Anglo-Saxon monastic house that preceded the Norman Cathedral. The stone, in its present position is clearly visible with the side showing Christ, the Virgin and 4 other figures facing out into the chapel; but the other side is very difficult to view as is sits a few centimetres away from curved wrought iron railings at the back of the Lady chapel. 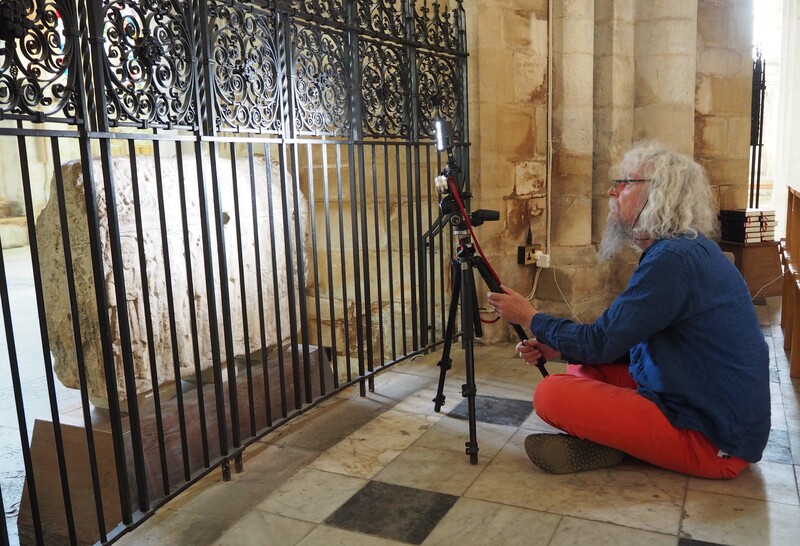 Creating a visual record of the stone which can both enhance our ability to interpret the eroded sculpture and make it ‘virtually’ available both for researchers and the general public on the internet is particularly challenging. Over the last 15 years the ever increasing power of our computers and related scientific and survey instruments has enabled us to record three dimensional surfaces in ways that could not have been predicted 25 years ago. Laser scanners, which use the time of flight of reflected laser beams to create very high density 3D point-clouds comprising many millions of reflected points, can be used to create highly accurate digital 3D models which can be viewed on high powered desktop computers and on the internet. Laser scanners remain very expensive, require the use of complex and also expensive software and powerful hardware as well as highly trained operators and a lot of time to process the results. 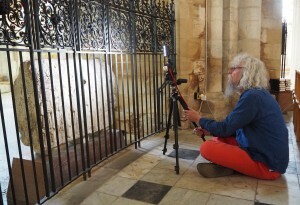 These factors and the frequently inconvenient locations of many ecclesiastical sculptures reduce the obvious potential of these instruments for practical and simple operation for recording the magnificent assemblage of early medieval carved stone found in churches and cathedrals in Britain. Over the last few years alternative approaches have been developed that allow us to generate high precision 3D computer models using affordable digital cameras, computers and easy to use software. 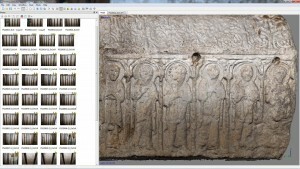 3Di or 3D imaging using digital photogrammetry is a relatively new technique for creating digital 3D models from digital photographs at everything from the landscape scale to individual small objects. 3Di models are generated using software that employs sophisticated algorithms including Structure From Motion and Bundle Adjustment which, given the right number and quality of overlapping digital photographs can calculate the relative position of the camera used to gather the images and then, using combination of camera positions and already identified image pixels further calculate the 3D position of the pixels in each image With this information the software can construct an accurate digital 3D model of the imaged surface for viewing and further analysis on a desktop computer or distribution on the internet. 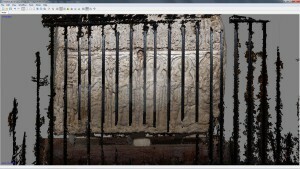 The 3d models are represented initially as point-clouds of multi-million individual 3D points coloured according to the original 2D photographs. A triangular network or mesh is calculated which maps to the surface of the point-cloud using varying sizes of triangles according degree of undulation in the surface, over which texture or fragments of the original digital images are applied to give the impression of 3D texture. 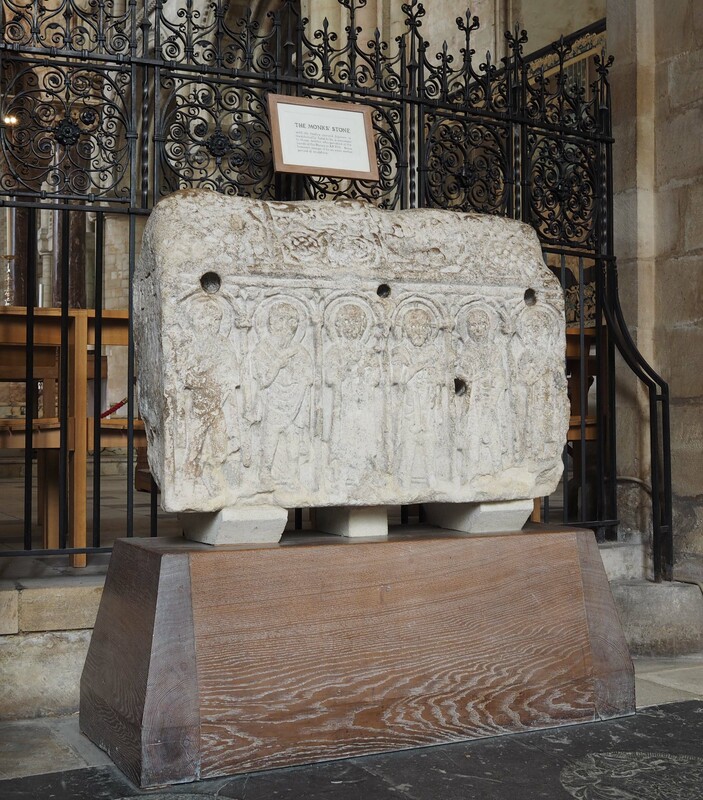 The modelling of the Headda stone posed a particular challenge on account of the presence of the railings which extend across the back of the stone, in an area which also has poor lighting made more problematic by higher levels of lighting coming from the windows behind the stone. The Headda stone modelling exercise was undertaken for multiple reasons; to test the viability of 3Di to accurately record the form of this sculpture despite the difficult location, to demonstrate that 3Di offered the potential to greatly enhance the record of ancient stone sculpture, to create a resource that could be shared in 3D on the internet and by mobile phone and produce an accurate archive that would support and enhance the archives of the Corpus of Anglo-Saxon Stone Sculpture, published and maintained through the University of Durham, and contribute to the curation and interpretation of the object by the Dean and Chapter at Peterborough Cathedral. 3Di image generation from digital photographs requires high quality, well focussed and sharp photographs. In this case an Olympus OM-D EM-1 and EM-10 camera bodies, recording 16 megapixel images using an Olympus M.Zuiko 17mm. f1.8 lens ( many thanks are due to Olympus UK for the loan of this lens). The standard zoom lenses sold with most digital cameras are rarely as sharp as single focal length ‘prime’ lenses or professional zooms. An LED light panel was mounted upon the flash hot-shoe on the camera, and the camera mounted on a solid tripod. In order to create the 3Di model, images which cover the whole of the surface to be modelled must be photographed with 60% overlap across images in all directions, ideally the detailed observed in each pixel should be visible in minimum of 3 images taken from different positions. 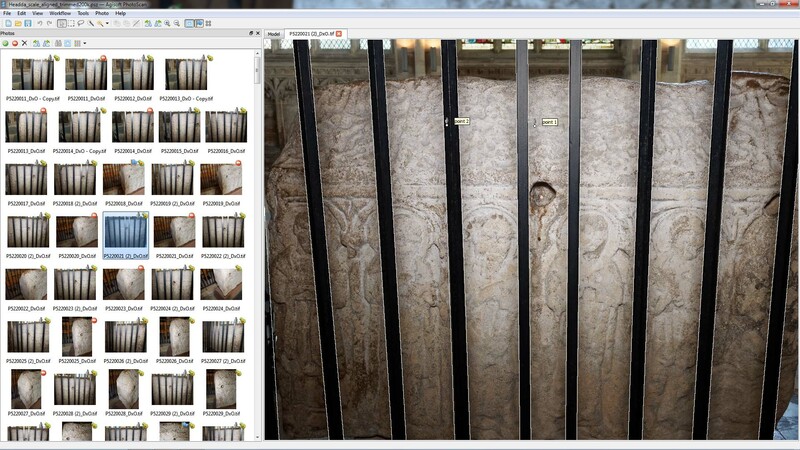 For the front of the stone which is not obscured it was easy to record a sequence of images across the stone at different heights, with additional images recorded going round the corners of the stone. 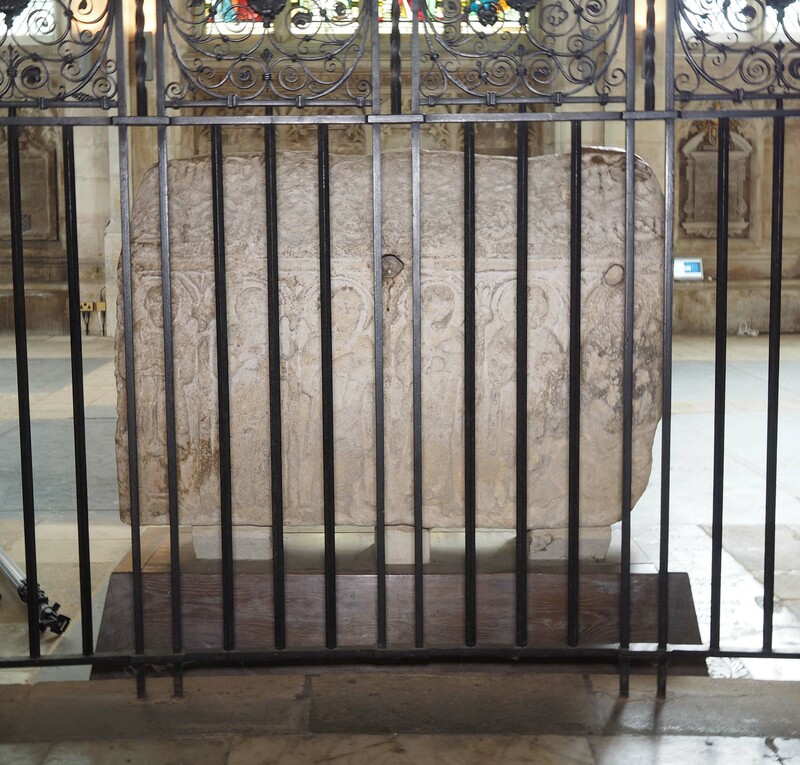 The reveres of the stone required a more complex approach with images collected in a series of arcs ensuring that all parts of the surface were visible from different angles observed through the railings. All photographs were exposed using manual exposure/aperture settings and recorded in JPEG and RAW formats. JPEG images which employ averaging algorithms to reduce the file size are not ideal for precision modelling, RAW images which store the full image details as recorded by the camera sensor were used for modelling. The RAW images were initially processed using DXO Optics Pro, software which uses specifications calculated for each lens and sensor combination to fine tune each image reducing distortion and increasing sharpness by tiny amounts. The processed files were then saved in TIFF format prior to use for modelling. The 3D modelling software used for this project is Agisoft Photoscan Pro, selected from many different available packages following an in depth assessment of most of the available Structure from Motion (SfM) packages available in 2013/2014. The data was processed using a very high specification PC running windows 7 64 bit on an i7 quad core processor with 48Gb of RAM and an NVIDIA GTX 670 graphics card with 2GB of graphics RAM.. Agisoft Photoscan Pro continues to lead the field in SfM processing although faster computing platforms can inevitably be found today. 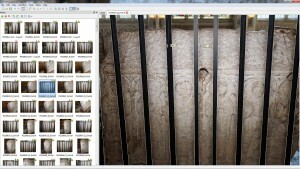 Once the images had been checked for sharpness, a total of 345 images were selected, from a total of more than 800, for modelling; this is more than would normally be needed for optimum results, the railings however meant than the back of the stone needed many more images than would otherwise have been required. As a first attempt a model was generated without any attempt to remove the railings, this first model took about 48 hours to process completely; generating the 3Di model requires a number of different processing stages, calculating camera positions, generating a high density point cloud, a triangulated surface mesh and finally applying image texture to the mesh. 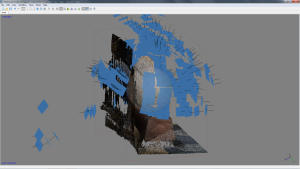 The point cloud comprised about 63 million points, from which meshes of different densities were required for archive, high and low resolution models for internet display purposes. Had it not been for the complexity of recording ‘through’ the railings far fewer images could have been used, and the model may potentially be improved slightly visually by selectively removing any unnecessary photographs. Agisoft provides mechanisms for constraining the volume to be fully processed and thus the model could be further processed by eliminating the railings from the model before final processing. The high density point cloud produced by the software was very good with sub millimetre precision, but when the image texture was mapped onto the triangulated surface the texture included poorly defined stripes resulting from the presence of the railings. The only way to successfully eliminate the railings completely from the texture was to mask the images using a mask function in Agisoft to mask each individual railing and any shadow or merging of the pixels on the railing edges. This process was time consuming but in the end meant that all trace of the railings could be eliminated. Once fully processed attention was turned towards producing output files that would be useful at a variety of different scales to facilitate viewing for different purposes and supporting different levels of computing power. The 3Di files themselves can be very large and require specialist software which in effect makes it difficult for interested non computer experts to use, however a new internet based software utility combining the functions of online storage and online display has been developed by a French software company Sketchfab, founded in 2012. Agisoft and a number of other professional software products include functions that directly support export of files to Sketchfab, which not only provides a central repository for 3Di models but allows them to be enhanced though shading and viewed on almost any computer using the internet for file delivery. Some files will be too big for viewing on some computers and so files at multiple resolutions have been created, perhaps the most extraordinary reflection of current day computing is the fact that these models can also be viewed using a smart-phone. In addition to creating 3Di files that could be viewed from anywhere using the internet researchers need results that can be measured and shared with colleagues and not necessarily on the internet. For this purpose 3D Adobe PDF files were generated with correctly scaled models using scaling information in a set of photographs that were use to scale the model during processing but omitted in the texturing of the final model. The 3D PDF format is an internationally accepted archive format which supports 3D measurements and can be viewed on most modern computers. In addition to the textured models placed in the Sketchfab environment or saved in PDF files, a non textured high resolution model without the texture or colour information was also placed on Sketchfab as a monochrome triangulated model which is more suited to observing fine details of the surface form. 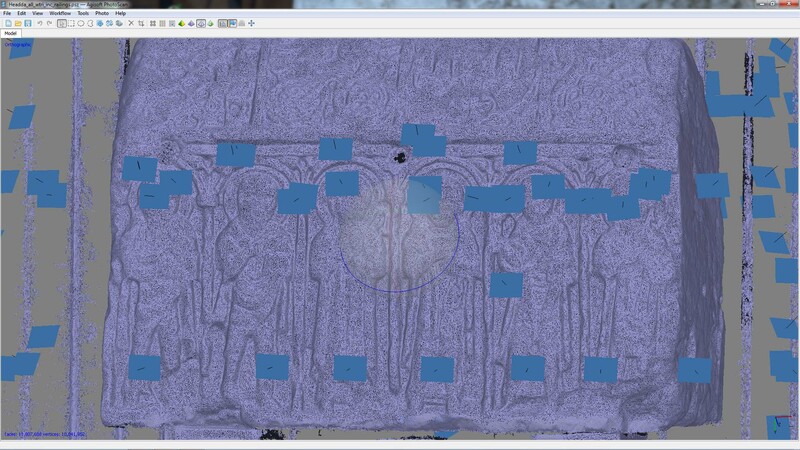 The 3Di modelling of the Headda Stone has been a great success and in addition to creating an easily accessible archive of 3D models, has revealed details that cannot be seen with the naked eye (eg: the figure on the right hand end of the reverse of the stone. The youthful face that emerges probably identifies the figure as either John, Thomas or Philip). Headda Stone triangular mesh – it is this mesh that describes the shape of the surface and it is optimised to show more detail on curved rather than flat surfaces. 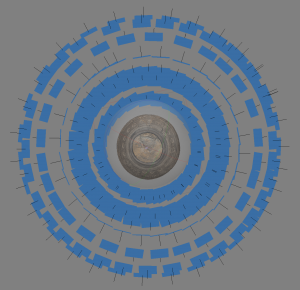 The final model and others generated as part of the same research project can be viewed using on the Sketchfab archive site in a folder entitled Soke of Peterborough.